Discussion in 'Cat Behavior' started by kids and pets, Apr 22, 2015. We have always had a pets. But I have never run into this issue before. A couple years ago my daughter adopted a cat from the local shelter. At the time he was an indoor only cat, and over the years has become indoor/outdoor. He really enjoys being outside during the day, and will go to the door and ask to go out. This is not a problem. The problem: At night he will cry in a high pitched skull splitting yowl to be allowed out, then in, then out, then in... all night long. If you ignore him he gets destructive and keeps crying. If he is locked indoors (and wants out) he will scratch the door, yell from another room, beat on the door causing it to bang in the frame, etc... This has caused some household damage. If he is outside and wants in, he will scratch the door, the wood deck and rails, climb the screens, claw the new vinyl siding, and keep yowling. Despite everything, he will keep yowling. This is not a sound that can be ignored. He is getting more and more vocal as he gets older. He cries to tell us he is using the litter box, that he used the litter box, that he wants you in the living room with him, that he is eating dinner, etc... My husband has lost all patience with him, and its really getting to me as well. I have not had a decent night sleep this season since the snow started melting. In the winter he is quiet at night, because he does not want to go outside. So 3/4 of the year he is yowling, and its getting worse. I have taken him to the vet, and run tests to make sure nothing is wrong with him. He has a clean bill of health. He has no interest in playing. He has toys, we have a laser lights, etc... No interest from kitty. We have a large German Shepard dog, who is great with the cat. Cat has no interest in the dog for the most part. The cat loves to lay with me, or cuddle next to me on the couch. He answers to his name, and sometimes will come when I call him. As I am typing this he is curled up next to me purring like crazy, content. A couple of years ago my husband put in a cat window, it lasted a few months and we had to stop that idea. The cat loved it, but was bringing in live critters daily. He would stun the critter, bring it inside, and watch for it to wake up. Then the cat would not catch it, would ignore it as it ran around my house. I have found live snakes, squirrels, chipmunks, birds, mice, moles, and a rabbit. I cannot tolerate that. We live in a small town in the woods, and there is a never ending supply of critters to carry inside. If anyone has a suggestion, I would love to hear it. I have a soft spot in my heart for this cat, especially since she belongs to my youngest daughter who is away at college. But our health is being negatively affected by the lack of sleep for months on end. There has to be something we can do. The first question, is he neutered? That could make a big difference in his behavior. I am sure he as since you have been to the vet and the vet would have told you that the yowling behavior to get outside can be caused by not being neutered. Have you thought of using a pet door? You can purchase them today where you get the cat microchipped and when the cat approaches the pet door it will open. Only he can open it. So other critters could not get into the house by following him. Of course he can bring them inside in his mouth. Have you thought of a cat enclosure. There are so many ideas out there if you search the internet. He could then be outside safely. Since you have started the habit of letting him out, this often happens. Have you tried a da Bird wand toy? Most cats really really love them. You may just have to search for the right toy. Even something as simple as a shoe string might be fun. You can place a towel over it and slowly pull. Most cats go crazy. You can also entice him with a bit of catnip. So when he yowls and cries and carries on, what do you do? Do you cave and let him out? If he stays inside, how long does he cry/yowl and carry on? You might look into Feliway diffusers and/or Composure liquid Max calming supplement. You can find them both on Amazon. I know this is really frustrating. I hope that you can find some answers here. Yet remember that behavioral changes take time and effort. You let him out and if you want the behavior to stop, you either need to never let him out or build him an enclosure or use the pet door idea with the microchip. Be patient and take the time to help him. I forgot to mention, he is fixed and up to date on all immunizations. He has 2 cat condos in the house that he uses as a scratching post. Considering his behavior when he is content, verses when he wants in/out, I believe the damage to the house is intentional. He does not bang doors, scratch walls, doors, or furniture, climb curtains or screens when he is not demands in/out and yowling. Its like a Jekyl and Hid complex. Welcome to the site!! Sounds like "Sleepless in ????" over at your place. Sleep is an important necessity in life too. You answered all of my questions as I read on in your post. The vet check, blood tests, etc. That would have been my first suggestion although, you mention that this behavior ceases over the winter months when the cat doesn't care to go out. So that led me to think this is not a medical issue at all. It is one very confused kitty - I want out, I want in, I want out, I want in..... maddening so. I don't have a whole lot of ideas here other than to suggest putting a couple of these near the door at night right before you go to sleep. These are very safe to use and work wonders to keep indoor (and even outdoor) cats away from a particular area. They are motion detection air blasters and boy, do they work well. You could also apply sticky paws to the door frame. That will 100% stop the scratching on the door frame. Do you have some vertical cat trees near some windows? Sometimes adding some vertical space in the home helps tremendously with many behavioral issues. 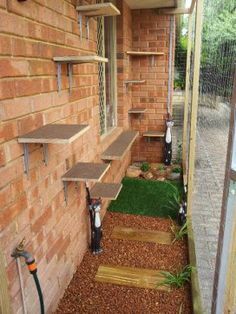 Even some cat wall shelving. Leaving out at night before bed a cat treat ball filled with some Temptation Treats may help as well. Sounds like your cat gets so stressed over this nighttime ritual along with all of you, rightly so. I also recommend Jackson Galaxy's Spirit Essences. http://jacksongalaxy.com/spirit-essences/ Look over his products and there is one for calming such obsessive behavior. I can vouch for these working - well - they work for my cats anyway. Also - as for the cat window access. There are electronic pet doors where the cat/dog wears a collar that unlocks and opens the door only for that particular pet. I am not saying to get this one as I don't know which one would be the best rated but this will give you the idea. I know of someone who uses this for their small dogs when they are at work during the day. It will not allow intruders to come inside the home as the door only opens for the pet wearing the collar! Tried the cat door, but that is when he was bringing in all kinds of live critters. Tried a cat enclosure, and he continued to yowl because it limited his freedom to go where he wanted. He wants out, to roam. I have not tried daBird. I have tried numerous toys, He just is not interested in toys. We have a laser light that he can chase, no interest. He also does not like cat nip. When he was younger he played a little with the laser. But it has been a few years since we could get him to play with anything. The vet says he is just older, and not interested. Its not unusual. Last spring/summer we made him stay inside. We would ignore his cries and yowls. He would literally cry on and off all night, with no more then a 5 minute break. We finally gave in by the end of August and let him out. We could not take it anymore. He never stopped the crying and yowling all freaking night long. We leave the bedroom door open at night, so he could come snuggle if he wants. I keep his litter box very clean (at least 2x a day I clean it). We tried using a water bottle to spray him when he yowls at night, all it did was make him stay further away and yowl louder. This year started about 2 weeks ago. My husband or I have caved in and let him in/out because we are remodeling the house and cannot afford the damage he does when he cannot go out. Seriously, my hubby may take him to the shelter if I cannot get this under control. We have tried calming meds, and the diffusers. (plug them in the wall and there is a scent that calms the cat) but neither had an effect. The meds actually seemed to bother him more, and he sounded like a drug yowling cat then. I have not tried the sticky paws or the SSCAT idea. I may try them. I am concerned about the dog though. He is a long hair dog. If he rubs against the sticky stuff will it pull out his hair or cause it to mat up? Plus as the dog is a senior he is losing his sight/hearing. Sudden sounds/movements like doors creaking open seem to disturb him. WOuld the SCCAT do that? Actually kind of funny....the cat was yowling so bad last year that the dog would start to whine then howl after the cat wouldn't shut up. Poor dog really had no ideawhat to do with the cat. Thank you for your suggestions. I love it that there is somewhere I can go and people who love the cats as much as I do. I suggest a weekend away when your daughter returns so you and your husband can get a good nights sleep. I am so sorry to read this. I've not had a cat indoor/outdoor only one or the other, and the outdoor cats were feral/semi-feral. I can say this, as long as you let him out, he'll continue to do so. Do you have a large dog crate? A large plastic one, to hold, cat, food, water and litterpan? I always lock mine up during recovery/sick periods. It may take some getting used to if he's not ever been crated. Also might cover the crate with an old blanket until he settles down, then let him loose during the day, lock him up when he starts his behavior. You will need to decide, indoor or outdoor only. Because at this rate, its not going to work. It might take a few weeks or a month, as long as this has been going on, its going to be hard to break. I do hope you can keep him in and alright, because honestly, a cat like this, will not take to shelters and it will not end good. Please let us know how he does. On the crate idea, if you can get a clip-on water dish, it helps immensely to keep it from spilling. I hope something works out for your family and your kitty so that you can all get your rest! I want to just add in my thoughts about the crate. I am not fond of the idea for this particular usage. I do use crates and cat enclosures for many reasons but this would not be one of them. I think it will cause much, much stress on your cat and the cat will only howl and yowl even louder and longer. Putting him inside of a dog crate, behind closed doors in the office could create some even more difficult behavioral issues as he will not understand why this is happening. Although, I understand your need to do something! Maybe cat proofing the office and putting sticky paws on the inside of the moldings so he doesn't scratch at the door at night may help. You can transition him into the office slowly by "catifying" the room with some fun cat trees/toys and all of his necessities. I just think the crate will be tooooooo much for him to handle - mentally. Anyway - just my :2cts: and completely understand that you are desperate here so your husband lets you keep the cat. MEGA VIBES for your kitty. Sometimes, cats take to it much better being crated and having a space all to themselves, a little cat lair. I've had cats that would go and sleep in their crates with the door left open. I tried the dog crate. First, the crate was set up in the office all day, so the cat could be used to it first. The office is also the "cat room", and he is comfortable in this room. I put his litter box, fresh water, his favorite blanket in the crate.The cat does not like for a room to be without lights, so I also put a lamp in the room, this allowed a lower light at night but not complete darkness. Night 1- Followed our usual evening pattern. This usually consists on me sitting on the love seat with my favorite blanket, and the cat curling up next to me and kneading my blanket. When it was time for me to go to bed, I picked him up, calmly petted him as I carried him down the hall to the cat room. I placed him in the crate. He just blinked at me, no concerns. Closed and locked the crate, and left the room, shutting the door behind me. (This room usually has a closed door.) Cat was quiet, I assume laid back down to sleep for about an hour. Then he threw a fit. Started with meowing and yowling, like when he wants to go outside. Yowling and screaming, rattling the cage, this went on all night. The cage was on a carpet with 2 sides by the wall, and by morning he had the cage moved across the room from throwing himself around in it. I listened to see if his cries would change, just in case he hurt himself. No, he was royally ticked off and that is about it. When I let him out about 7 am, he snubbed me and was really pissy. He sauntered off to get breakfast, and an outside potty trip. (He did not use the litter box overnight) As the day went on, he was fine and behaved like his usual self. Right now he is curled up on the couch next to me like he does every night. Hubby wore ear plugs last night, and he could still hear the cat screaming all night. The cat room/office is several rooms away, and that room has double sheet of drywall for sound proofing assistance. I will be going to bed in a few minutes, and we will start night 2. Any idea of how many nights this might take before he calms down? Or until he decides to not allow me to catch him at night to put him in the crate? Please, read my post above, if you missed it. I can't give any more advice than that on the use of the crate. I don't recommend the crate for this issue and would be very worried this cat will injure himself by throwing himself around the crate and moving it across the room. Not to mention the negative mental impact and this bringing on other possible behavior issues. He did not make the crate move this time, maybe he learned or just was not as angry. But he did yowl and scream all night. Hubby is not being supportive of doing it again. He said if I do, and the cat wakes him (or keeps hm from getting to sleep) he will put the cat outside. Which of course undermines the entire thing. I am not to thrilled with the idea either, but I want to keep the kittie. Now, when I went in and greeted him this morning, he was ticked off, but calm enough. He snubbed me and strolled out and straight to his food dish, then the back door and demanded out. A few minutes later he was back and demanding in. toys- he has zero interest in toys. I have tried and tried and tried. I have 3 Sccat sprays on order from Amazon. Should be here soon. I have to figure out where and how to make this work. We have 3 doors that lead outside, and another into a garage. If he is discouraged from one he will go to another. He is only allowed out 1 specific door, but he knows they all go outside. Currently if he cannot get into our bedroom he will stay down the hallway to cry and yowl, which would be out of range from the spray. HHmmm, some thinking to do. Sticky paws- I like the idea, especially if he was scratching furniture. I am not sure how to incorporate it into this issue though. I can't tape up all the doorways. These are the same doors the dog uses, and we use.I have not gotten hubby to buy in on this idea either. I do appreciate everyone's opinions. I know we all have different experiences, and we all love our cats. I think Romeo has "forgiven" me for the crate. He is curled up next to me again on the couch purring and sleeping on my favorite blanket. He really is a lovable guy. Ok, so it sounds like we have to be pragmatic here. This is a highly willed cat, who has been accustomed to going out at night. Is everything fine for your sleep and with him when he does go out at night? At this point...could you make the decision that he IS allowed out at night? Is it only the live prey he brings back in that is putting you off? If so, thinking pragmatically, which, is worse; no sleep, live prey, or shelter for the cat which is not going to lead to life. If live prey is the least worse of these options, then how could we mitigate that? Could you be ok with live prey being confined to one room, so you know in the morning that THAT will be the place you need to inspect and there are no other surprises? If so, maybe cat flap one small room with a closeable internal door; eg, a laundry. The room is sealed to the rest of the house, put his bedding and litter and lovely homely stuff in there for him, with the cat flap in the door to the outside, and then the bedtime ritual becomes tucking him goodnight into this room. shadowsrescue and handsome kitty purraised this. Sorry to hear the crate idea didn't work. Please keep us posted. I am really glad you're willing to work with him on these issues. He is a strong willed cat. I don't mind that he is indoor/outdoor. I love the freedom it gives him to come and go as he pleases. He prefers to come and go all day and night. Daytime is not an issue, as I can open the door for him. If we are at work, he is either in or out for the duration of our work day. The only issue with that freedom is the live critters, and yes, he has brought in live snakes. I cannot handle snakes. Mice, squirrels, rabbits...are bad enough but I am not afraid of them. Snakes, no, just no. There is only one window in the house that the cat can access, and it is in the back livingroom. Hubby can put up a "step" off the deck, and the cat can jump from eh step to the ledge outside the cat window. This also discourages other critters from entering. I even considered a cat door into a basement window, but that is not an option. There is no way for him to get from the basement to the main house. Thereis no way I would haveknowledge of critters he is bringing into the basement either. A side issue... he went outside yesterday. I now have a couple spots of poison ivy on my arm, hip, and leg from where I held him or he leaned against me. Any suggestions? I am terrified of snakes, so I fully understand. I assume that he is bringing them in by grasping them in his mouth. How about making sure that his mouth is busy munching on something else when he enters? Maybe leave treats in an automatic feeder next to his entrance point so he has to drop the critter to eat the treat? You could rug something to be pressure-triggered to release a treat when he is just about to enter. Given all the efforts you have made so far, this one seems minimal.